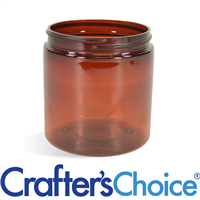 This 4 oz Amber Basic Jar is made of PET plastic. Use this plastic amber jar to package a variety of cosmetics including body butters, creams, hair gel and more. The amber color is great for light-sensitive product. This Amber Basic Jar made of PET plastic can be used to package product that may be light sensitive. This dark amber jar is also great for fall products, men's products and much more.